The Norwegian Escape cruise ship has many different categories of cabins and suites. The 95 most expensive accommodations are in The Haven, the cruise ship's exclusive suite, and luxury amenities complex. However, those who either can't afford The Haven or prefer to spend their vacation dollars on other things still have 2,080 different staterooms to choose from. The 1,130 Balcony Cabins are in 12 different categories and are the most predominant type of stateroom on the Norwegian Escape. These cabins range in size from 207 to 239 square feet, and the balcony size ranges from 32 square feet to 77 square feet, depending on the location. All Balcony Cabins feature two twin beds that can be combined into a queen. Some with either a sofa bed or a Pullman sleep up to four guests. The Balcony Cabins have a nice-sized bathroom with shower, plenty of storage space, and a flat-screen television. The Norwegian Escape cruise ship has five categories of Oceanview Cabins. These cabins have a large window rather than a door leading to a balcony. The 114 Oceanview Cabins range in size from 161 square feet to 252 square feet. Although most of the Oceanview Cabins sleep two guests, some of the Family Oceanview Cabins can sleep up to five guests. The Family Oceanview Cabins have a bathtub/shower combination, while the other Oceanview Cabins only have a shower. The other major category of cabins on the Norwegian Escape is the 408 inside cabins, which do not have a balcony or an oceanview window. These are also the smallest and least expensive cabins, ranging in size from 135 to 201 square feet. The Family Inside the Cabin shown in the photo above and some of the other inside cabins sleep 4 guests, but most of the inside cabins only sleep two. The Norwegian Epic was the first cruise ship in the Norwegian Cruise Line fleet to feature Studio Cabins designed for solo travelers. The 82 Studio Cabins on the Norwegian Escape cruise ship have their own private complex with the colorful hallways seen in the photo above. 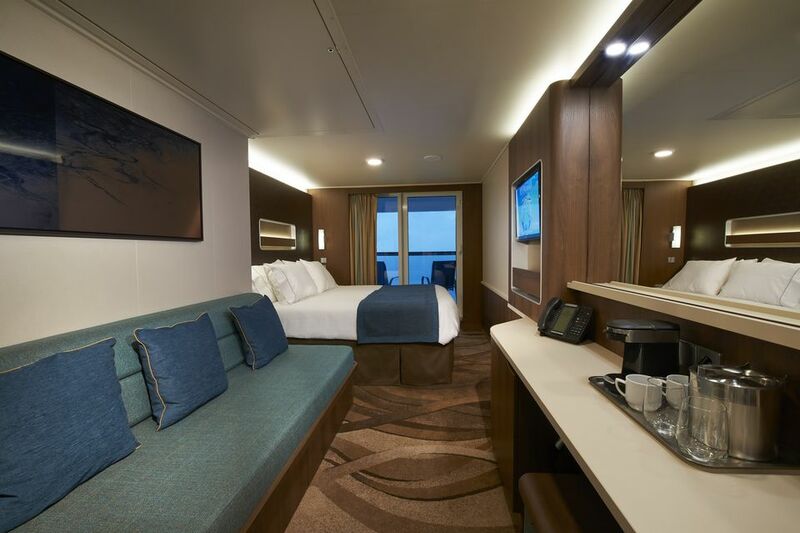 Although most solo travelers would say the "no single supplement" is the best feature of the Studio Cabins on the Norwegian Escape, the Studio Cabin complex also features a private Studio Lounge for the solo traveler guests staying in the complex. The Studio Lounge is a private meeting place for the solo travelers staying in the Studio Cabins on the Norwegian Escape cruise ship. This small lounge is perfect for getting together before dinner or just getting acquainted with fellow travelers who enjoy traveling alone, but who still like to socialize. The 82 Studio Cabins on the Norwegian Escape cruise ship measure 99 square feet. Each has a double bed, a one-way window looking out onto the hallway, and a private bath with toilet, sink, and shower. These cabins are tiny, but perfect for budget-conscious solo travelers.